No I haven’t given up on the 5:2 diet. In fact I managed to find a sensible day for a fast yesterday, though I had to shape my meals around a lovely piece of Rose Veal that I brought back from Boscastle. One of the great scandals of the British food industry in my opinion is the slaughter of male calves at birth because the Great British Public doesn’t understand Veal. When I was little, most of the veal we could buy was pale, creamy coloured meat. It came from calves that were penned and reared in very confined cages to keep the meat tender. 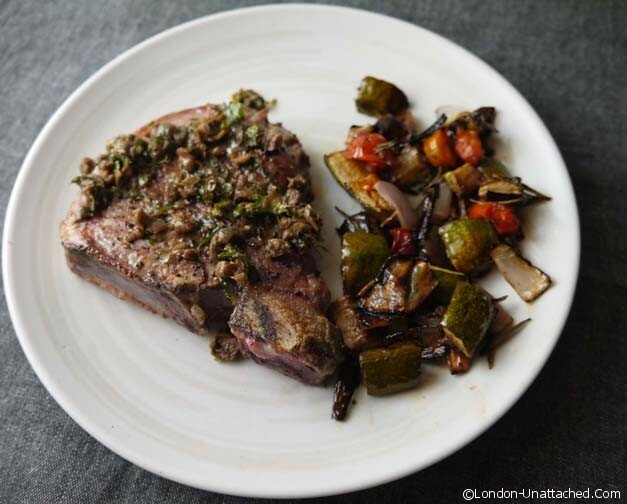 But, rose veal was always available – not as fashionable but very tender and very sweet. Then there was an animal welfare campaign and the market for ALL veal was decimated. The rather sad result was that it was no longer economical for farmers to rear male calves from milking stock, so they are slaughtered at birth. Rose veal generally comes from calves around 10 months old. The meat I bought at Boscastle was milk reared from one of Cornwall’s leading producers of cream, butter and milk, Cansford Farm. I did indulge in a tiny pot of clotted cream and some of their butter too, but, obviously neither of those featured on my 5:2 diet fast day! I’m not going to insult you by writing out a full recipe for a grilled steak and some oven roast vegetables. I made a caper and fresh herb butter for the steak, with about 20g of butter, half a teaspoon of capers and equal quantities of parsley and tarragon (the only soft herbs left alive in my garden). The oven roast vegetables were 6 cherry tomatoes, a banana shallot, a clove of garlic, some rosemary and a diced courgette, all dressed in a teaspoon of extra virgin olive oil and the same quantity of balsamic vinegar. The result was an extremely tasty and filling meal which I estimate at about 350-400 calories. One of the reasons I really like the 5:2 diet is because it seems to be the ultimate flexible lifestyle diet. You can tailor the fasting days to your own preferences and if you happen to take a break (as I did on my recent trip to Sicily), you don’t just put back all the weight. I find it relatively easy to eat well on fast days. I avoid ready meals because I don’t find them as satisfying as food I have made myself. Maybe that’s psychological or perhaps it is because I tend to limit calories by following some simple rules and eating real food! Chia – high in fibre and protein and chia seeds are hydrophilic and absorb water up to 30x their own weight, so can help you feel full! Starchy food (rice, potatoes etc). Make sure you weigh the amount you plan using and check whether the calories given are for dried or made up quantities. Cheese – check the calorie count and WEIGH what you plan on using as cheese is quite dense. While it sounds like common sense, it’s amazing how easy it is to slip into eating a few crisps, the last couple of squares of chocolate or a lump of cheese. And all of that adds up pretty quickly if you only have 500 calories to play with! My next 5:2 diet fast day is Sunday and I’m planning to try some seaweed I found at Boscastle…watch this spot. This looks delicious. I’ve yet to try cooking rose veal myself! 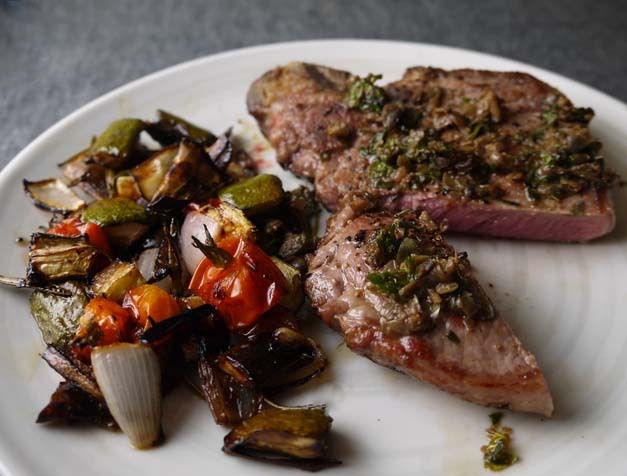 The rose veal steak looks delicious. Great list of low fat goodies too, thanks. thanks janice…I did enjoy it. Now I just have the cornish venison!